Irene and George were literally born for each other. Their mothers, Bernice and Sally, best friends since childhood, concocted a cockamamie plan to have babies at the same time and raise them in parallel ways that would make them seem fated once they finally met as adults. Wham—their children would fall in love with each other, Bernice and Sally could live out their twilight years as in-laws, and their children would be deliriously happy and fulfilled by their bizarrely arranged marriage. Of course, it doesn't work out that way at all. Sally and Bernice's relationship falls apart, and Bernice loses herself in a lake of gin. The plan is off, abandoned along with their friendship. However, they may have set in motion something that can't be stopped. George and Irene are both grown now, astrophysicists working at universities, and when their lives intersect, their undeniable connection is just as their mothers originally planned. I'm trying to come up with a way to describe this book without making it sound like a super-cheesy romance novel. It isn't one, at all, but every time I talk about it, I feel like I'm summarizing a steamy, melodramatic bodice-ripper. There are definitely some heated encounters between Irene and George, but those scenes are more scientific than carnal. Irene has some serious commitment issues and cynicism about destiny, but her slow journey to trusting George isn't trite like a two-hour romantic comedy. The book works because it's not formulaic. It's a weird, writhing conglomeration of random things: the science of black holes, reading the future in tea leaves and crystal balls, online fantasy role-playing games, a girl who speaks in whistles and squawks like a bird, a man whose scientific discoveries have come to him from hallucinations, a late-night expedition into a funeral home to steal ashes. All of that in one book, and it not only makes sense, it sings. 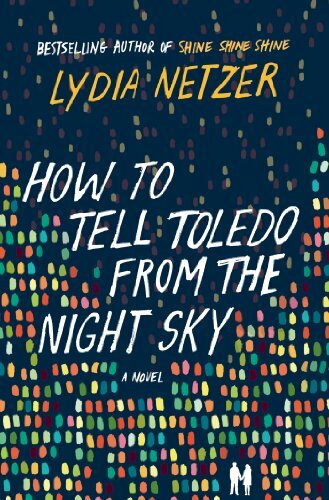 Lydia Netzer has a supremely creative yet twisted mind, and her latest book is the trippiest and sweetest romance you're likely to read. With regards to NetGalley and St. Martin's Press for the advance copy. On sale July 1.